A CCTV survey commissioned by the Client and undertaken by others identified a cracked storm drainage pipe within a residential road in Long Ashton. 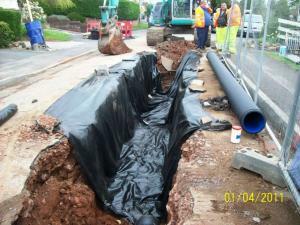 The drainage pipe was suspected to fail so the Client undertook the necessary works to replace the damaged pipe. The works involved a full road closure and securing the working area with Herras fencing. During the works the client identified the localised presence of Asbestos Containing Material (ACM) (Chrysotile) in fragments of cement bound sheeting, the works were suspended and VertaseFLI was called to assess the site. Provision of Health and Safety documents, supervision of works, handpicking ACM, excavation and disposal of ACM bearing soils, placement of a geotextile barrier, ambient air monitoring. Inductions and toolbox talks were given to operatives prior to works commencing. Screening was erected on the Herras panels to prevent dust emissions migrating outside of the working area. Ambient air monitoring was undertaken. Soils were misted with water to reduce dust emissions. Hand picked ACM shards were double bagged and disposed of at a suitably licensed facility. VertaseFLI maintained the Health and Safety measures used during the handpicking works. ACM soils were excavated and placed in lined 20 yard skips for offsite disposal. 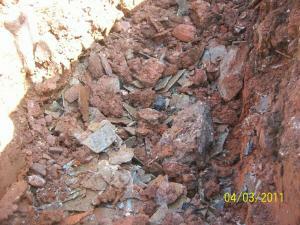 A geotextile was placed under the new pipe, so subsequent workers would not be exposed to ACM soils.